This really is a pleasure to inform that after the evening today, readers of Orissa will get a set of wonderful work of letters that they were craving for but not getting in book form together so far. I had spent in my youth a lot of nice time in the pages of Paurusha, edited and published by Sri Janaki Ballav Pattanayak, watching Sri Krishna, as if live, in the matchless translation of K.M.Munshi’s Krishnavatar by his wife Smt. Jayanti Pattanayak. Paurusha had become the opium for my family because of this translation and Jayanti, the centre of our admiration. I have always felt distressed that contemporary Orissa lost a magnificent lady of letters as she entered into power politics. Time had come when I was a bitter critic of her political life. But there was never a moment when old copies of Paurusha carrying her Krushavatar had failed to enchant me. In fact, when tired of going against the tide I was opting out into solitude for revival, often I was wading through the pages of the old copies of Paurusha in my study till reaching the Krishnavatar episodes. Just a browsing thereof was acting like elixir. In course of time, tallying the translation with the original, I have found that the translation is in no way less creative than the original. I have no hesitation in saying that had Munshi ji ever been able to study this translation; he should certainly have admitted that his imaginations were in expressive best in Jayanti’s translations only. 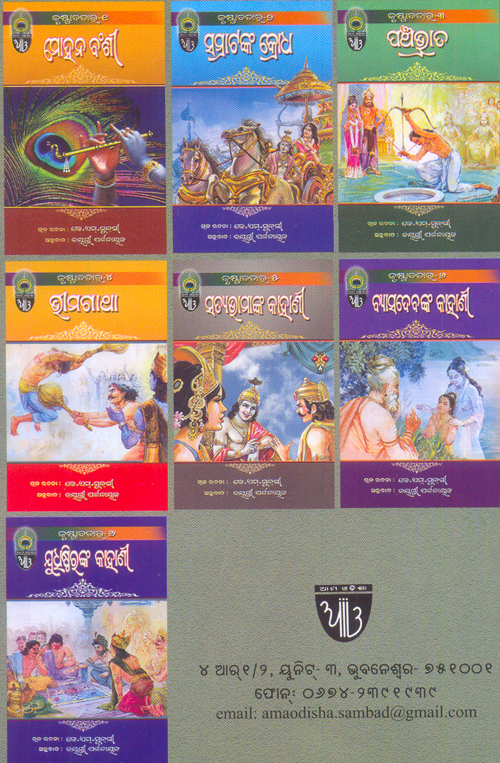 Ama Odisha, publisher of the seven volumes, deserves unreserved thanks for the remarkable contributions it has made to Oriya language and to the Oriya nation by bringing out the translation in a set of seven volumes. It is scheduled to be launched in the evening today at the State Information Center (Jay Dev Bhawan).